MY PALLET GARDEN: STILL VERTICAL, BUT BETTER – nate.p.k. Last year I made a vertical pallet garden inspired by the many that I was seeing on Pinterest. But what I hadn’t seen on Pinterest was how to deal with a pallet garden that sat on a deck in the sun and high heat for a majority of the day. This left me dealing with daily (sometimes twice daily) watering and, even then, by midsummer I’d lost about half the plants. So this year, I changed my strategy. Instead of the plastic pots that drained too easily, I went with terra-cotta pots. Instead of placing them behind the pallet slats, I thought I’d try hanging the pots on the front of them. And instead of planting flowers that needed a lot of attention, I went with some succulents and a few geraniums for color. Oh. My last bit of advice whilst palleting … wear sunscreen. I got overly into my little DIY project and didn’t realize how long I was on my deck soaking up the sun. Now I know how last year’s pallet felt. 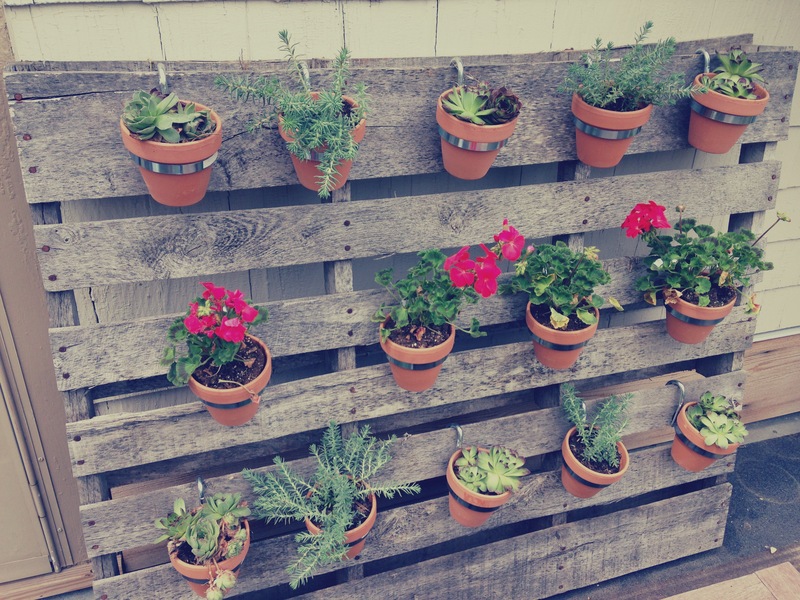 Pingback: More time lost to a Pinterest idea: The Pallet Garden. | nate.p.k. Pingback: More pallet? | nate.p.k. Awesome stuff. I MUST do this!!! !